Since its opening in 1973, Moosewood Restaurant in Ithaca, New York, has been synonymous with creative cuisine with a healthful, vegetarian emphasis. Each Sunday at Moosewood Restaurant, diners experience a new ethnic or regional cuisine, sometimes exotic, sometimes familiar. From the highlands and grasslands of Africa to the lush forests of Eastern Europe, from the sun-drenched hills of Provence to the mountains of South America, the inventive cooks have drawn inspiration for these delicious adaptations of traditional recipes. 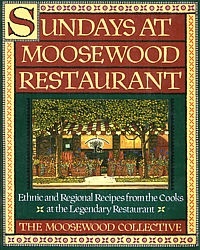 Including a section on cross-cultural menu planning as well as an extensive guide to ingredients, techniques, and equipment, Sundays at Moosewood Restaurant offers a taste for every palate.